East Anglian Daily Times - The Swimming Pond Company Ltd. There is no doubt it was a little nippy – 16 degrees nippy – but what do you expect if you dive into a pond at the end of September. The weekend had been incredibly hot and the sun was still shining as I sat looking out of the kitchen window at Paul Mercer’s swimming pond. “It’s such a shame you’re not going to have a swim,” he said (rather cunningly, I thought). Never one to pass on a challenge I borrowed a costume from his wife Bianca: “I couldn’t let you have the bikini, I was in it all weekend,” she said. I took from this that she had been swimming in the large, beautifully landscaped swimming pond which is the show swimming pond for Suffolk based The Swimming Pond Company, run by Paul Mercer, 47, of Bressingham. Their dog Stella was in and out of the water and I had hoped she might keep me company as I jumped in, not once but 3 times. It has to be said that this was largely out of a need for Paul to capture photographic evidence of such madness than any desire on my part to keep jumping in! But that aside there is a certain quality about these ponds which brings out the child in you, making you want to swim in as natural environment as possible. Remember the heady days of childhood when the summer holidays really did go on forever and you would start by paddling in the river, only to get so wet you might as well go in up to your neck; those magical days when you would look into the clear waters of a river and yearn to dive in with your friends. Translate that to a globe-trotting young adult, bowled over by swimming in mountain rock pools in the southern hemisphere and before you know where you are you have a business idea. What has emerged is a company very much of the moment when people want to commune with nature and provide pools not only which they can swim in but which will also attract wildlife. The kingfisher which sits on Paul’s decking most mornings bears testimony to how well these ponds work and the wildlife that comes in their droves. 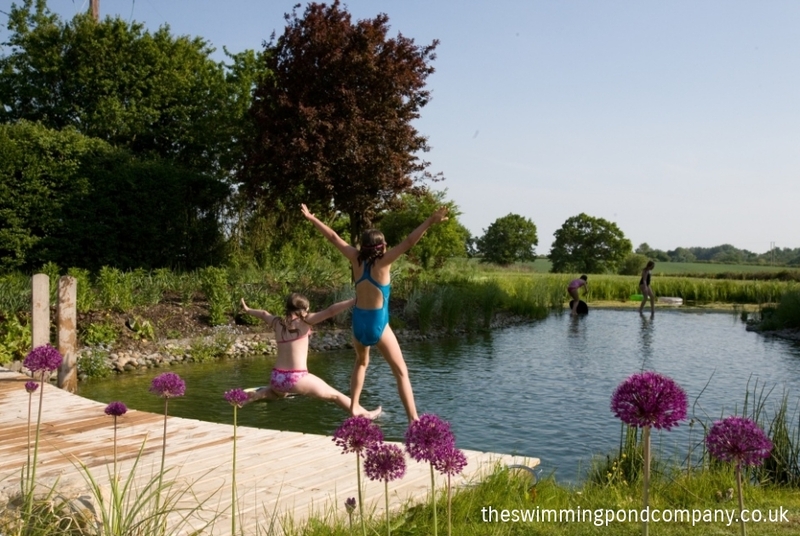 Added to this when you step out of a swimming pond you do not smell of chlorine, your skin does not dry out and you do feel exhilarated because there is a certain childlike wildness about swimming in a pond rather that the more clinical, germ-free, chemical laden swimming pool. Paul invites potential clients to visit his home to see his show pond which is now four years old and very well established. The science is that an existing or new pond is dug out in such a way that there is a deep section – your swimming area and a very shallow section which is referred to as the regeneration zone. The swimming pond is lined with an artificial liner so that water losses are due only to evaporation and a constant water level is maintained. The two areas are then separated by an internal block wall. The water is circulated through the regeneration zone and because the water here is relatively shallow, rather like a rock pool on a beach, it heats up more quickly in the sun. The warm water is then fed back into the main swimming area naturally raising the water temperature. All the circulation pipe-work is buried under a shingle shelf which is made up of filtration material and various grades of gravel in which the aquatic plants grow. Paul said: “It is a natural filtration system using the constant movement of water and specialist planting to remove nutrients in order to create clean and clear water. Planting around the margins will favour native species but native bullrushes tend to be too invasive so a less fervent variety is used, which works well with the irises and water lilies – all there to encourage wildlife, keep the water clean and of course to look good. As we walk round we see a fish. I would not have thought fish would be compatible to a system such as this. I am right, well half right, because I have not seen a fish at all, it was a newt. I am however, able to spot a water boatman and various other bugs skitting about the surface or just beneath. These environments are of special interest to children, who will spend hours fascinated by tadpoles, water boatman and the huge array of life which the water supports and will enjoy learning about the ecology of the habitat while having fun. Any fear of swimming with frogs and toads, however, should be put firmly out of your mind because while they will have moved in during the spring they have no desire to swim with you and will be long gone before the first toe breaks the surface. “We have a kingfisher who sits on this post,” says Paul as we arrive back at his decking area just outside his back door. As we look over the swimming pond something swims across, neither of us can quite see what it is. Paul hopes it is a water vole, which would be the ultimate in environmental kudos. “It would be great if we had water voles in the area and they became established here,” he says. Paul created the swimming pond with the help of friend and water specialist Johan Vandenberg-Hider who has more than 20 years experience creating lakes, ponds and reservoirs. And four years on the two men still work in that way. Paul runs the company and Johan heads up the construction team.